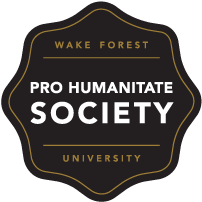 There are several different ways to support Wake Forest through philanthropic giving, many of which are designed to help maximize your level of contribution. No matter the method you choose, or the size of your donation, each gift helps the University provide a world-class educational experience and wide range of opportunity for deserving students and faculty. To assure proper crediting and distribution of your gift, please ask your broker to note your name on the gift. Students can give with Deacon Dollars by contacting Anthony Tang (tangam@wfu.edu) or looking for opportunities at events throughout the year. If you work for a company that matches charitable contributions from employees, you may be able to double or even triple the value of your gift. Forms are available through your company’s human resources department. Wake Forest University has been blessed with generations of leaders whose vision and generosity have built one of the top universities in the country. That tradition continues today through the Wake Forest Fund Giving Societies. 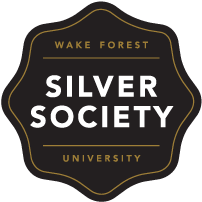 The Giving Societies recognize Wake Forest’s most generous and dedicated alumni, families and friends, all of whom have made a five-year financial commitment to any designation within the Wake Forest Fund. The Parents’ Campaign of the Wake Forest Fund is an annual campaign to raise money for the University’s current operating budget. When parents and families make gifts to the Wake Forest Fund, the money is used this fiscal year for the University’s most pressing priorities – from recruiting top faculty, to providing leading edge technology in the classrooms and library, to supporting innovative academic programs like the Summer Management Program, to investing in our expanded and outstanding career development program. Parent gifts make an immediate impact on Wake Forest students! Why does Wake Forest need a Parents’ Campaign? Most private schools have three main sources of funding: tuition, income from the endowment, and annual gifts. Tuition simply does not cover the cost of running a private university. Without the generous support of current and past parents – along with alumni and friends – tuition would have to be higher than it currently is to maintain the Wake Forest experience. When a parent makes an endowment gift, the principal is not spent; it is invested. The resulting earnings from those investments help the institution grow. Annual gifts to the Wake Forest Fund are not invested – they are used right now to sustain current year operations and activities. Annual gifts are the lifeblood of the institution. 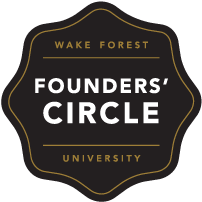 As foundations and corporations consider grant applications, they frequently ask about the percentage of participation in giving from Wake Forest alumni, parents, and friends. It strengthens our case when those closest to the University support us. How much are parents and families asked to give? The decision as to the size of your gift is a personal one – the important part is that parents participate in the Parents’ Campaign, no matter the amount. Parents give from $10 to $100,000, and participation at every level is needed and appreciated! When you make a gift to the Parents’ Campaign, it will be joined with the gifts of other parents, and those gifts add up to a remarkable total! In 2012-13, current and past Wake Forest parents donated $2.2 million to the Parents’ Campaign of the Wake Forest Fund. This is a significant endorsement that Wake Forest parents believe in the mission and direction of the University and support it with their own giving above tuition. You may make a gift by cash, check, credit card (MasterCard, Visa, or American Express) or appreciated securities. If you work for a matching gift company, you may be able to double or even triple the value of your gift. Forms are available through your company’s human resources department. All gifts to the Parents’ Campaign are tax-deductible. For more information about supporting the Parents’ Campaign, please contact Betsy Chapman, director of family communications and volunteer management, at chapmaea@wfu.edu or 336.758.4845. The Reunion Campaign began in 1955 with a twofold purpose: first, to generate enthusiasm among classes to return to campus at Homecoming to celebrate their class reunion; second, to organize alumni volunteers to assist in raising money from their classmates for a gift to support undergraduate education at Wake Forest University. Reunion campaign gifts celebrate the education you received while ensuring that the Wake Forest experience will endure for future generations. All gifts to the Wake Forest Fund will count toward the campaign, with the highest priority on unrestricted undergraduate support. Gifts made between July 1 of the year before your reunion through your Homecoming and Reunion Weekend will be included in your class gift totals, which means you have the opportunity for gifts from two fiscal years to count in your class campaign. 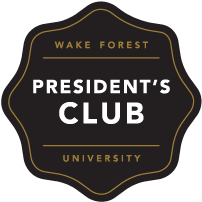 A reunion gift at the leadership level will qualify you for membership in the Wake Forest Fund Giving Societies. Multi-year commitments to the Wake Forest Fund will also be included in the campaign totals, so consider making a sustaining gift in honor of your reunion. In addition to a dollar goal, every class has a participation goal for classmates to make a gift to the campaign. Your participation in the reunion campaign indicates the impact Wake Forest has had on your life, whether it was financial aid that allowed you to attend, professors who challenged you intellectually, alumni networks that provided career and community opportunities, or the enduring life-long friendships that we each treasure. The 1834 Student Campaign works to educate and raise awareness among undergraduate students of the University’s need for philanthropic support. Tuition covers only about 75% of the total cost for each student to attend Wake Forest. The University turns to the Wake Forest Fund to offset the difference in order to provide the best possible experience for students. Every gift matters – no matter how small or large. Seniors: U.S. News & World Report bases part of its ranking of universities on alumni-giving rates. Therefore, every gift from your class increases our national ranking, increasing the value of your education and raising the University’s national profile. By giving, you show that you value what the University has contributed to your life and that you are willing to invest in its continued success. 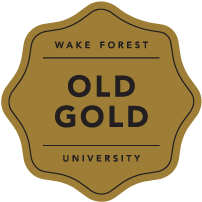 What is the Wake Forest Fund? The Wake Forest Fund acts as a reserve of unrestricted dollars for the University to use for a variety of operating expenses. The main priorities of the Wake Forest Fund are student aid, faculty development, emerging programs for students and library and technology resources. While the Wake Forest Fund has a number of gift designations, giving to the general fund allows the University to support the most critical priorities at that time. While all gifts are appreciated, donations to the Wake Forest Fund are the most immediately valuable to the University. Gifts to the Campaign go to the Wake Forest Fund, which provides unrestricted annual support to the University, allowing your gift to be used where the need is greatest. Your support will sustain excellence in teaching, scholarship, and academic programs at Wake Forest, and it will preserve the quality of a student experience without equal in higher education. Who are this year’s 1834 Campaign Executive Committee? The 1834 Campaign is tasked with pushing for larger engagement with younger class years to establish a solid investment in the 1834 mission prior to senior year, graduation, and beyond. It is our hope that in the long term, this will setup our student body to become lifelong Demon Deacons. If you are interested in applying to be on the 1834 Campaign Committee, please view the following packet of information. The packet of information includes what the 1834 Campaign Committee is and what it will look like moving forward. We hope you will consider being a part of the 1834 Campaign Committee! 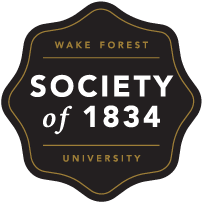 Being a part of the 1834 Student Campaign allows me to reflect on what it means to be a member of the Wake Forest community. Wake has given so much to me, I can only hope that I can give back through my time and dedication to making Mother So Dear the best it can be! I’m honored to be a co-chair for the class of 2014, and even more honored to call myself a Demon Deacon! Gifts of securities to Wake Forest University may be handled in several ways. You may make your gift by electronic transfer, by mail or by hand delivery. There are definite tax advantages in giving property that has appreciated in value and has been held long-term. $47 – $20 = $27 capital gain per share. 200 shares x $27 = $5,400 in capital gains. Tom could sell the stock, pay the capital gains tax and donate the remaining proceeds to Wake Forest. If, however, Tom donates the stock to Wake Forest, he would not incur any capital gain and he could deduct the entire current value of the gift (200 shares x $47 = $9,400) as a charitable gift. An income tax deduction is allowed for the full fair market value of the property given. In addition to receiving a charitable deduction for the full fair market value of such a gift, the donor pays no capital gains tax on the appreciation when the gift is made (although the alternative minimum tax implications must be considered). Such a gift is deductible up to 30 percent of a donor’s adjusted gross income. Any excess can be carried over for five additional years. Donors can elect to deduct a gift of long-term appreciated property at the 50 percent ceiling of their adjusted gross income. However, the donor must forgo the appreciation in computing the charitable deduction. In other words, the deduction is limited to the donor’s cost basis. A donor considering a gift of property that has gone down in value would be better off selling the property to realize a deductible loss and then contribute the proceeds to charity and obtain a charitable deduction. Usually a gift of closely-held securities, such as one from a family corporation, qualifies for the same advantages (a full deduction, no capital gains tax, and the 30 percent limitation) that are available when marketable securities are given. An attractive alternative is available to the donor who does not wish to give up control over any part of his or her closely-held stock. This arrangement initially involves an outright gift by the owner of the closely-held stock to Wake Forest; at a later date the corporation could purchase the stock from Wake Forest for cash. As long as Wake Forest is not obligated to sell the stock to the corporation, the transaction should produce no adverse tax results. Gifts of tangible property, such as art, jewelry, antiques, gold or silver, offer an immediate tax deduction. The amount of the deduction is determined by whether or not the gift is related to the educational purposes of the University. If the use of the contributed property is related to the purposes of Wake Forest, the donor is entitled to a charitable deduction for the full fair market value of the property, subject to the 30 percent ceiling and carryover. If use of the contributed property is unrelated to the exempt purposes of the University, the donor is entitled to a charitable deduction for his or her cost basis in the property. When the donor is the creator of a contributed tangible asset, the deduction is limited to the actual cost of producing the asset. The original stock certificate or affidavits of loss and/or non-receipt must be completed and submitted. Stock certificate assignment form(s) (Stock Power(s)) must be executed by the registered owner(s) giving us the name(s), address(es) and Social Security numbers(s) of the transferee(s). If the security is jointly owned, both must sign. A letter of intent to donate the stock should accompany the stock power. The signature of the custodian OR the beneficiary must be guaranteed by an eligible guarantor institution (bank, stock broker, savings and loan association or credit union) with membership in an approved signature guarantee medallion program pursuant to Securities and Exchange Commission Rule 17Ad-15. Stock certificate assignment form(s) (Stock Power(s)) must be executed by the executor or administrator, giving the name(s), address(es) and Social Security number(s) of the transferee(s). The signature(s) of the assignor(s) must be guaranteed by an eligible guarantor institution (bank, stock broker, savings and loan association or credit union) with membership in an approved signature guarantee medallion program pursuant to Securities and Exchange Commission Rule 17Ad-15. Official Certificate of Death (under seal). Official Court certificate (under seal ) showing appointment and incumbency of the executor or administrator (if estate did not go to probate a waiver of probate must be filed). Stock certificate assignment form(s) (Stock Power(s)) must be executed by the transferor(s), and include the name(s), address(es) and Federal Employer Tax I.D. # (or Social Security #(s)) for the transferee(s). The signature of the assignor must be guaranteed by an eligible guarantor institution (bank, stock broker , savings and loan association or credit union) with membership in an approved signature guarantee medallion program pursuant to Securities and Exchange Commission Rule 17Ad-15. Certified copy of Resolution by the Board of Directors or extract from By-laws authorizing the assigning officer(s) to sell, assign and transfer securities. Affidavit that the registered holder is a partnership, and that the person signing is a partner with full authority to sell, assign, and transfer securities. Affidavit that the registered holder is a proprietorship, and that the person signing is the proprietor with full authority to sell, assign and transfer securities. Stock certificate assignment form(s) (Stock Power(s)) must be executed by the surviving tenant(s), giving the name(s), address(es) and Social Security number(s) of the transferee(s). If your intention is to add another name as joint owner or change the registration in its entirety, your signature(s) will have to be guaranteed by an eligible guarantor institution (bank, stock broker, savings and loan association or credit union) with membership in an approved signature guarantee medallion program pursuant to Securities and Exchange Commission Rule 17Ad-15. However, if the shares are to be registered in your name only, your signature is sufficient. Stock certificate assignment form(s) (Stock Power(s)) must be executed by the registered owner(s) giving us the name(s), address(es) and Social Security number(s) of the transferee(s). If the security is jointly owned, both must sign. The signature of the trustee must be guaranteed by an eligible guarantor institution (bank, stock broker, savings and loan association or credit union) with membership in an approved signature guarantee medallion program pursuant to Securities and Exchange Commission Rule 17Ad-15. Stock certificate assignment form(s) (Stock Power(s)) must be executed by the registered owner(s) giving us the name(s), address(es) and Social Security number(s) of the transferee(s). Official Court Certificate (under seal), showing appointment and incumbency of the executor or administrator. Copy of the Title and Signature pages of the documents to support the authorization of the signing individual. The signature of the trustee must be guaranteed by an eligible guarantor institution (bank, stock broker, savings and loan association or credit union) with membership in an approved signature guarantee medallion program pursuant to Securities and Exchange Commission Rule 17Ad-15 (if estate did not go to probate a waiver of probate must be filed). Electronic Transfer is the most efficient way to transfer securities to Wake Forest. If your stock is held at a broker, notify the broker that you wish to make a gift of securities to Wake Forest University. Your broker will need written authorization from you before they can make the transfer. Be sure to tell them the name of the stock that you want to transfer, the number of shares, and where you would like your gift to be designated. We also ask that you contact Gayle Parker either by email at parkerdg@wfu.edu or by calling 336.758.6086 to let her know that the gift is in process. Shares are sometimes transferred into our account without information, including the donor’s name. Your phone call will allow us to match up your name with the correct stock gift.